Located just north of Taos on the highway to Taos Ski Valley in New Mexico, the Tarleton Ranch property has been a working cattle ranch and hay farm, owned and maintained by the same family for over three generations. The Tarleton Family now wants to develop their 430 acre property with a variety of mixed uses, in a manner that preserves approximately 230 acres of open space for agriculture. Working with the Tarleton family and local developer Mark Yaravitz, John Halley of GaiaQuest is master planning a Permaculture based evolution of the existing Tarleton Ranch into a vibrant mixed-use eco village development and eco-farm that generates renewable energy, grows organic food year round, provides enhanced ecosystem biodiversity and contributes a net zero carbon footprint opportunity that the health of our planet depends on for future generations. 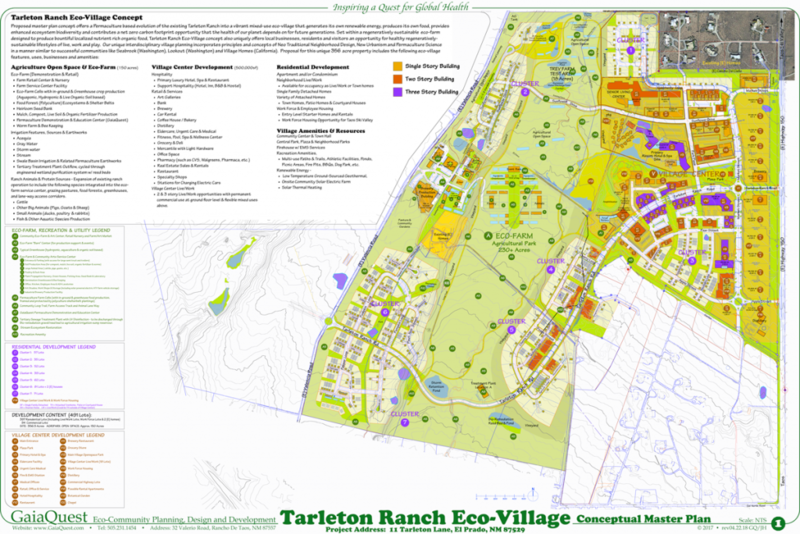 Developed around a central regeneratively sustainable eco-farm park designed to produce bountiful localized nutrient rich organic food, the Tarleton Ranch Eco Village concept also uniquely offers local businesses, residents and visitors an opportunity for healthy regeneratively-sustainable lifestyles of live, work and play. Ranch Animals & Protein Sources* – Expansion of existing ranch operation to include the following species integrated into the eco-farm service center, grazing pastures, food forests, lane-way access corridors and greenhouses (aquatic species). • flexible mixed uses @ 2nd & 3rd stories. • Ponds, Pool, Picnic Areas, Fire Pits, BBQs, Dog Park, etc. * The developer/seller reserves the right to change features, amenities and pricing without notice. Renderings, photography, illustrations, floor plans, amenities, events, finishes and other information described herein are representative only and are not intended to reflect any specific feature, amenity, unit condition or view when built. The actual condition of the project, amenity or unit, when and if completed, will control. The improvements and amenities depicted are proposed only and need not be built. There is no representation or warranty that any particular improvement or amenity will be constructed or constructed as shown. No representations and warranties are made with regard to the accuracy, completeness or suitability of the information published herein. Obtain the Property Report Required by Federal law and read it before signing anything.